Two weeks past launch – how are things going? So, this blog has been pretty quiet the past couple weeks. The reason is fairly obvious, though – Dak and I have both been busy playing Guild Wars 2! The game has officially been out for two weeks now. It did not have the smoothest launch, but compared to many others, it went very well indeed. ANet’s been working hard to clear up issues as they appear, and it shows. As of writing, I have seven characters (one more than I had originally planned on). Liusaidh, my mesmer sylvari, is my main, but I also have Janan Savitri (human thief, descendant of my GW1 Dervish), Ragna Blazefur (charr elementalist), Brynja Rabbitfoot (norn ranger), Katta (asura warrior), Rosheen (sylvari guardian), and Carella (human necromancer). Liusaidh is currently level 72. Did I expect to level as quickly as I have? Oh my god, not even close. I’m actually really amazed that I’m as far with her as I am. My short attention span is to thanked for that, I think. And yes, you heard that right. Me having a short attention span is the reason I’ve progressed so much further in this game than I had figured I would have in this time period. Let me put it this way – this game is ridiculous for short attention spans. And I mean that in a good way. Nearly every time I set out to do something, I spot another thing going on, and then another, and so on and so forth. Suddenly it’s three hours later, I’ve leveled up several times, and I realize I never got to what I was going to do in the first place! A very good example of this was a few days ago. I’ve been running around with Opt from Malefic Incantations a lot in-game, and while wandering Lornar’s Pass after finishing a story quest, I ran into him. And then revived him as he decided to test if Death Shroud helps against falling damage (hint – it does not. But it was funny!). We went exploring across Lornar’s, found a portal to Dredgehaunt Cliffs, went “sure, why not”…and proceeded to spend the next three or four hours exploring in there. And that seems to be the case whenever we go to do anything. I love it. I also got addicted to crafting. I’d say that as a guild we’re all pretty big on crafting, but damn did the “must make things!” bug bite me hard. I don’t even want to think about the amount of money I’ve probably thrown at fine materials at this point. I’m just shy of 350 on tailoring, and my jewelcrafting is in the 330s. The character that is my jewelcrafter, Janan, has gotten to level 14 almost entirely through crafting. I foresee maxing out both of these disciplines fairly soon. I also got artificing up in the 100s but I haven’t really concentrated on that one too much. I also made Katta a weaponsmith because I don’t believe our guild really has one. Oh yes, the guild. I am the leader of I Can Outtweet a Centaur! [TWIT], which started out as an unofficial twitter community guild and has grown well beyond that. Right now we’ve got about 75 members, and exactly the sort of atmosphere I’d want from a guild I’m a part of. I’m going to be plain – I love my guild. There is such a sense of companionship, and it’s great. We’re such a sharing, giving group – I like the idea of giving it forward, and we do that very well. Help is always given where it’s needed, people are always offering up stuff they get that they think someone else could use, and we’ve got a guild bank stuffed full of goodies because people put stuff in more than they take stuff out. 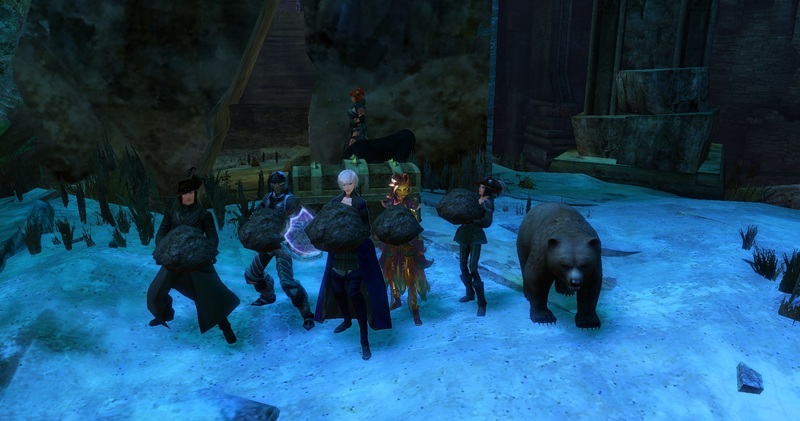 Not to mention the silly, ridiculous things we do – like Orr runs at low level, creating a cult of the boulder while doing Ascalon Catacombs, and spontaneous dance parties any and everywhere. It’s so much fun, and I’m so glad and honored to be a part of such a group. Not everything about the game has been perfect so far, though. The very first night was littered with severe lag and disconnects…though that did clear up pretty quickly and is unsurprising, considering the number of people logging in at once. The morning after headstart guilds broke entirely – guild creators would show as not being in a guild, were unable to be invited to any or start any, but would show up on their guild roster as a member but not representing. Invites in general also were not going through. Thankfully this was fixed, but it took a few days. The trading post being down for so long definitely sucked. I won’t say it was a game-breaking thing, but…there’s no denying that it not being available for about a week and a half rather screwed up the economy. Certain materials have so flooded the market that it will be ages before they ever sell and the prices raise above rock-bottom. Crafted items simply do not sell unless you get lucky. People will list stuff for one copper above merchant value…either not realizing there’s a listing fee, or not caring. Things will eventually balance out, but it will take a long while, I think. Parties mostly work, but can still bug out and break on occasion. Quite frequently we’ve had issues where someone on an overflow can’t join their party on another overflow or the main shard. There’s an issue that crops up every so often where if a party member moves out of minimap range of the rest of the party they simply vanish off the map entirely and show in the party window as being in another overflow. The window doesn’t always accurately reflect where people are. Yesterday it would show people as being level 0 and having no profession. And getting into a dungeon with your group can sometimes be a gamble. Still no guesting. No guesting makes quaggans sad. In all seriousness, though, I really hope guesting gets added in soon. Free server transfers is all well and good and all, but…if you play on a popular server, you’re going to be hesitant to transfer to play with someone else because you may not be able to get back into your original one, and they may not be able to join you. If you’re on servers on the same data center (NA or EU), there’s a way to work around that using overflows, but as the number of times I see myself in an overflow is diminishing, it’s not a good solution. The one thing that really bothers me the most is that influence and guild upgrades are server-limited. [TWIT] is an international guild, and our members are all over the place. Many people are in other guilds as well, so they go where their main guild is. However, even if they’re representing us and they’re on another server…it doesn’t help our influence at all. On the flip side, stuff like our guild bank and our other upgrades? They can’t use! I’ve seen people say that it’s probably to keep guilds from dominating WvW on multiple servers, as well as the argument of “well why would your guildies be on multiple servers?”. As someone who doesn’t have much interest in WvW and isn’t going to tell her members to transfer to Jade Quarry or leave, I don’t care for either of those arguments. All that restriction does is harm cross-server guilds. Of course, were guesting in, it may not be a concern at all, but with the lack of guesting…well. It’s a big problem. Story quest difficulty. I don’t know what happened there, but it feels like they go all over the place. Some of them are just brutally hard. I’m saying that as someone who did a quest while 25 levels higher (with armor and weapons at my current level, traits all set up, elite skills, and so on) and I still got wrecked several times. It’s also sometimes extremely vague as to what you’re supposed to be doing. It’s also very obvious that the higher level stuff was not tested thoroughly. It’s rather frustrating, too, because I’d say about a tenth of the events I run into in the 50+ level zones are bugged in some manner – enemies don’t spawn, escortees don’t move, they get stuck somewhere, etc. Several personal story quests have been bugged, though thankfully none I did. I’ve been diligently reporting bugged events as I find them, and they’ve done a lot of personal story fixes, so here’s hoping that they’re also working on the DEs as well. All things said, though? I’m happy. I’m more than happy. I’m having a ridiculously good time in this game. I’m enjoying playing with other people (a rarity for me), I’ve got a great guild, I’m enjoying the story, crafting is stealing my life, dungeons are fun, and just…I’m having tons of fun. There is so much to do in this game – enough to keep me going for ages. So two weeks into the game, I’d say it’s not perfect, but nothing ever will be. That’s not stopping me from having the most fun I’ve had in a game in ages, though. 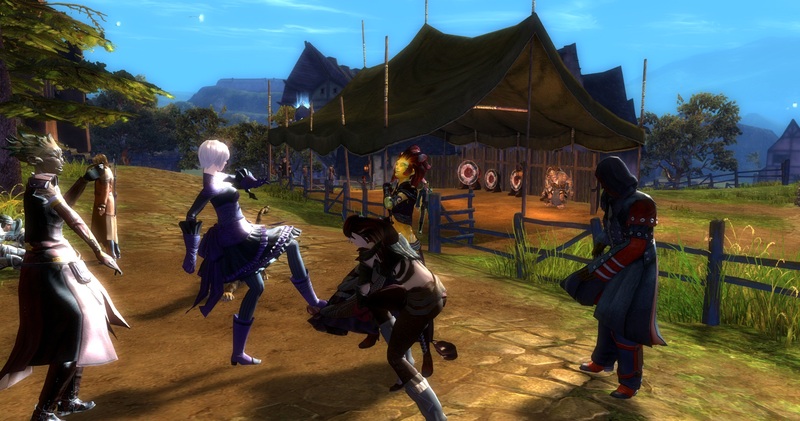 What do you think of how Guild Wars 2 is going so far?